I have noticed a plenty of blogger using Genesis Theme and did not changed favicon in Genesis. There are a number of methods which can be used to change favicon in Genesis WordPress theme. Here is genesis icon is looks like. And it is necessary to change default favicon in genesis with your custom favicon. It will increase your branding. Here I will show you three methods to change favicon in genesis WordPress theme. This method is for those who know how to use FTP. First of all make your custom favicon and convert it to .ico file. It is recommended your favicon size could be 16×16. If you ask to overwrite the file then grant overwrite or replace old favicon file. This method is for those who are not familiar with FTP. But this will require a little attention. Because you have to add some PHP codes in theme file. First of all upload your favicon.ico file to anywhere you want. In my case I have upload it in my upload folder. Now copy the code into a note pad and replace YOUR LINK with your favicon icon link. It will looks like below code after editing. 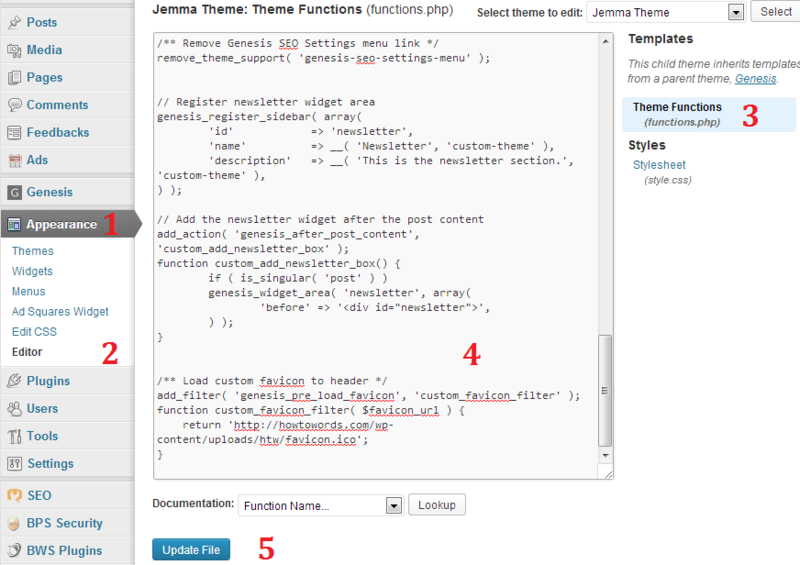 Now after editing copy the entire edited code and paste it to your functions.php file of your child theme. Paste the code at the end. Save the file that’s it. If you are unable to follow above methods to Change Favicon in Genesis WordPress Theme, then I recommend using a plugin to upload your favicon. But this will require your plugin always remains active. If you deactivate this plugin after upload then your default genesis favicon will reappear again. If you are facing any trouble to change favicon in genesis WordPress theme then feel free to ask in comments. Vishesh Kachheda recently posted…Giveaway – Win 1 Developer Account From Elegant Themes Worth $89! Thanks for visiting and commenting again. Changing Favicon using FTP is super easy. If you face any trouble then let me know. Still using Blogger Platform. Planning to change the platform and moves to WP. This post will be beneficial for me when I move to wordPress. I will bookmark this post. So that It will be easy for me to at that time. Pawan Paudel recently posted…Blogger Contact Form Widget-How to use in Separate Page? WordPress is far better than Blogger. I hope you will enjoy working on WordPress. I’m using the Genesis Favicon uploader plugin. But I should also try the functions.php method. I have also edited my theme file. Because it will not harm your blog. And in this way there is no need to activate favicon uploader plugin every time . Thanks for sharing the methods buddy 😉 Changing the favicon can be key in changing your brand, that is for sure. I am fine… And its my pleasure that my post is helpful for you. Most folks find it very difficult changing their Genesis theme favicon, thanks for sharing this post, though it would’ve made my life a bit easier if it had been written some years back all the same i will share them with anyone who is looking to change his Genesis theme favicon. I have seen lots of blogs that are using the default genesis favicon and I often wonder if they are just lazy to change the favicon or they dont just know how to do it. For those that dont know how to do it, I know they will surely find this post helpfu;. Sometime when i am browsing using Firefox, this browser did not show icons for many of blogs. Even sometime most popular websites seems favicon-less. May be most people are mainly using Firefox browser so that they are unaware about their favicon. Great write-up, Mubashir. You made it look simple enough for a person like me as well. Though I wont need to use it because I dont use Genesis. You have indeed break it down for anybody to understand and i must say that i truly did understand what you just said. I am not using Genesis theme but i am sure it will be useful to all that uses genesis, so i’ll share it across. Thanks! I did not know Genesis uses Function to render favicons. Your post will help anybody having Genesis. In my case, I look for the file of default favicon and replace that file with my favicon file with same name. This simply does all the work for me. I’ll never need that default favicon file, so replacing it with my file is pretty safe! But with your explanation, I learned some more! Thanks. Suresh Khanal recently posted…Aggressive Blogging Case Study: What Happens When You Blog Twice a Day for 5 Straight Weeks? Yes Replacing default icon of Genesis Favicon in images folder is easiest way to change favicon in genesis. My site’s was favicon not updating I’ve search many things about this but nothing get worked. But this is really working thanks for great post man. Worked, thank you so much for the tutorial. I used the php method and placed the code that you gave (with the url for my favicon) and I got a server error. Help! EEEEK! I tried the edit the php method and my entire blog dissapeared! I’m pretty sure I followed the instructions exactly… as soon as I removed the code my blog came back. Help? So this theme can be installed on any website without any hard-coded domains in the code. Hi, i just want to know, how i can float left of my blog image at my homepage? i have tried in my genesis theme settings but not working both right or left. please check my site homepage and guide me. I just check your website. Its working fine now. I saw your homepage is displaying post images on left on your homepage. Thanks Mubashar for reply, you checked very late, now i resolve this by changing my theme. and now its working fine. There was temporary error with my comments system.